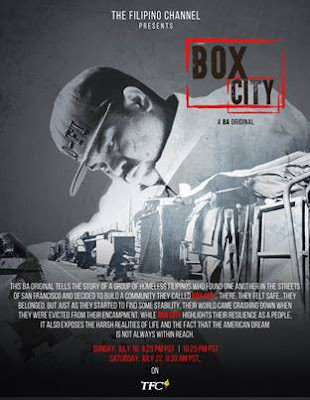 The advance screening of the BA Original “Box City” on Wednesday, July 12 at the TFC Studio in Daly City was a who’s who of the Filipino American community in the San Francisco Bay Area. Elected officials, community leaders, representatives of the Philippine Consulate, the education sector, and the press were deeply moved after viewing the 30-minute documentary that shows the plight of homeless Filipinos who found one another on the streets of San Francisco and decided to build their own “Box City.”. Watch this compelling material, created by the same team behind the 2013 (NorCal chapter) Emmy-award winning documentary “The Filipino Champions of SOMA,” and be part of an important conversation on homelessness. “Box City,” A BA Original, aired Sunday, July 16 at 4:25 P.M. (PST) with a replay that same night at 10:25 P.M. (PST). “Box City” will have another reprise on Saturday, July 22 at 9:30 A.M. (PST) on TFC.